FOR IMMEDIATE RELEASE: Portland, Maine (May 9, 2018) – The family that bleeds together, stays together. It isn’t exactly warm, fuzzy, wall-hanging material that you’ll find overlooking somebody’s mantle, but the statement applies to Tampa, Florida-based domestic partners Amanda Gallo and Michael Vizza. Fight night is Saturday, June 16 at Aura in Portland. Gallo (1-1), who stunned the crowd with her victory over Jayda Bailey in February, is scheduled to face Brianne Genschell (0-1) in a bantamweight clash. Vizza (1-2) will be paired with NEF newcomer Christian Barrett. The two fought one week apart in their most recent trips to the cage. Vizza was still training for a bout in Florida when they paid a four-day visit to Maine in the dead of winter for Gallo’s showdown with then-undefeated Bailey. Since relocating from Tallahassee to Tampa, the couple has trained at RMNU South Tampa. One of their coaches is NEF mainstay John Ortolani. After fighting in Georgia and Florida, Gallo wound up taking her first fight in Maine through her connection with Ortolani. The former lacrosse player, a veteran of 20 pro MMA fights, spoke highly of his own experience with NEF. Gallo felt the same welcoming atmosphere from both the promotion and its fans in her first go-round. It took a while for her to win over the crowd, of course. Many of them were responsible for selecting Bailey as NEF’s 2017 rookie of the year. Leading up to the fight, Gallo saw an internet poll in which 97 percent of the fans picked her opponent to win. Gallo had to laugh at the crowd response during fighter introductions, which was similarly slanted. After losing her debut in Thomasville, Georgia, by split decision to a veteran opponent, Gallo balanced the books with a unanimous decision victory at Bailey’s expense. She will take on another local favorite in Genschell (0-1), who fights out of Farmington and First Class MMA of Topsham. “I know she’s a black belt in jiu-jitsu, so that will be an interesting challenge,” Gallo said of Genschell. Challenges and surprises are part of the attraction of fighting in Maine, added Vizza, who also will take on a foe from the First Class stable in Barrett. 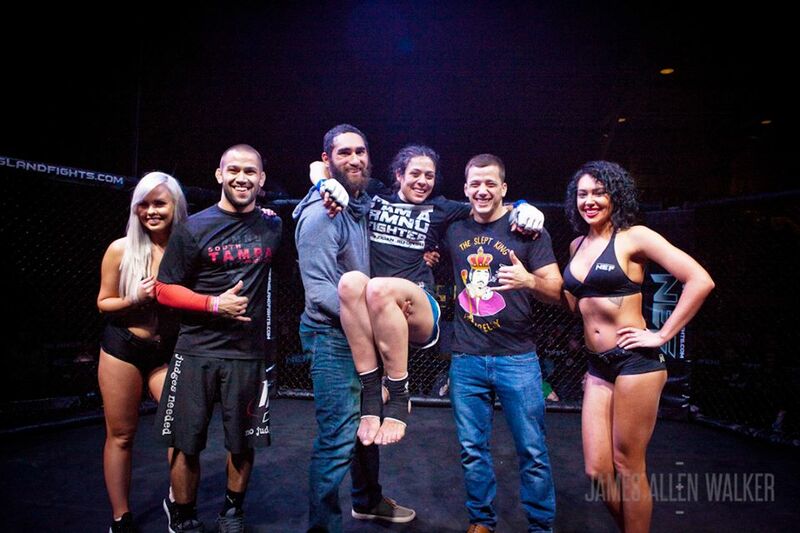 Vizza has a TKO win and losses by split decision and submission in his home region. Both fighters were impressed by the passion and loyalty of NEF fans. Vizza noted that seeing thousands of casual spectators at a local MMA promotion is unheard of in Florida. In Gallo’s case, women’s opponents are hard to find in her corner of the country. The sudden spike of competitiveness in NEF’s female ranks could make Maine a semi-regular destination for years to come. At this rate, Gallo and Vizza may become a well-known power couple – some 1,450 miles from home – in no time.